WASHINGTON, DC, July 23, 2012 (ENS) – Today marks the 40th anniversary of NASA’s Landsat program, the world’s longest-running Earth-observing satellite program. The first satellite in the Landsat series was launched on July 23, 1972 from Vandenberg Air Force Base in California. The Landsat record provides global coverage that shows large-scale human activities such as building cities and natural events such as volcanic eruptions. A single Landsat scene taken from 400 miles above Earth can accurately detail the condition of hundreds of thousands of acres of grassland, agricultural crops or forests. The program is a sustained effort by the United States to provide direct benefits for human and environmental health, energy and water management, urban planning, disaster recovery and agriculture, said Bolden. In cooperation with the U.S. Geological Survey, a science agency of the Interior Department, NASA launched six of the seven Landsat satellites. The resulting archive of Earth observations forms a comprehensive record of human and natural land changes. Landsat images from space contain many layers of data collected at different points along the visible and invisible light spectrum. 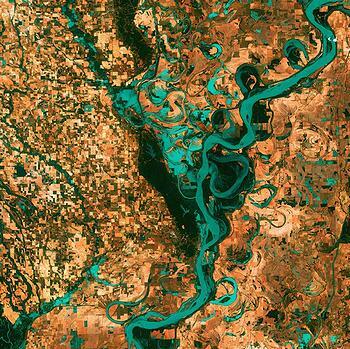 To mark the anniversary, scientists from NASA and the USGS chose the 10 most significant image sequences from the 40 years of Landsat data. Their number one choice is the 1980 eruption of Mt. St. Helens, which began with a series of small earthquakes in mid-March and peaked with a cataclysmic flank collapse, avalanche, and explosion on May 18. As the first eruption in the continental United States during the era of modern scientific observation, it was significant, although it was not the largest nor longest-lasting eruption in the mountain’s recent history. Another sequence in the Landsat top 10 are images from 1978 to 2011 that show the growth of Beijing, China from 7.89 million to more than 12 million people. A series of Landsat images of Amazonian deforestation in Rondônia, a state in western Brazil, provided impartial evidence of the increasing loss of global tropical rainforests and biodiversity. See a video of the sequence here. A detailed study of Landsat images by Compton Tucker, a biologist and tropical forest expert at NASA’s Goddard Space Flight Center in Greenbelt, Maryland, and David Skole, a physical scientist now at Michigan State University in East Lansing, showed that the annual rate of deforestation in the Amazon from 1978 to 1988 was lower than previously thought, but the impact on biodiversity was greater. Tucker says Lansat showed a common “fishbone deforestation pattern” in Rondônia, which creates many more miles of “edges” between deforested areas and intact forest. In these edges greater wind damage and drying of the forest occurs. Because humans have easier access, there are higher rates of hunting, poaching, and animal capture, as well as legal and illegal logging in these areas. Another selected Landsat sequence shows the shrinking of the Aral Sea, once the world’s fourth largest lake. In an arid region of Kazakstan and Uzbekistan, two rivers, the Syr Darya and the Amu Darya, carried snowmelt and rainfall from distant mountains to form the Aral Sea, which supported farming in the river deltas and a fishing industry through the 1950s. Then in the 1960s, the Soviet Union converted the local economies to cotton production and diverted the rivers to irrigate the fields. The Aral Sea has been evaporating and shrinking ever since. Fifty years later, the lake is 25 percent of its original size and it holds just 10 percent of its original volume of water. Remote-sensing satellites such as the Landsat series help scientists monitor changes and to detect trends in the conditions of natural resources. NASA is preparing to launch the next Landsat satellite, the Landsat Data Continuity Mission, LDCM, in February 2013 from Vandeberg Air Force Base. LDCM will join Landsat 5 and Landsat 7 satellites in Earth orbit to continue the Landsat data record. LDCM will be the most technologically advanced satellite in the Landsat series with sensors that incorporate advances in detector and sensor technologies to improve performance and reliability. Beyond the scientific information they supply, some Landsat images are beautiful to look at, offering spectacular views of mountains, valleys, and islands, forests, grasslands, and agricultural patterns. By selecting certain features and coloring them from a digital palate, the U.S. Geological Survey has created a series of “Earth as Art” perspectives. NASA and USGS asked the public to vote for their favorites from the more than 120 images in the online “Earth as Art” collection. Over 14,000 votes were received; click here to see the selected images.